Fat of the Land: Hunting? Now I've gone and done it. So, where to begin? First will be hunter safety class. Then I suppose a visit to a shooting range to fire an actual gun. (Bow-and-arrow can wait, don't you agree?) Maybe I'll even purchase my own firearm at some point. But before you get all excited and twitchy about my misadventures in this new land of weapons, killing, and bloodshed—oh, and mouth-watering recipes for wild game—keep in mind that my leap from forager to hunter will not be an overnight transformation. The learning curve is steep enough that this first year, I suspect, will yield mostly preliminaries, plus I've got a bunch more traditional foraging to attend to, and, well, I just don't want to make any predictions, okay? In short, I don't see an elk hunt in my near future. One of the commenters on my Resolution post mentioned hunting with firepower isn't really the same as foraging. While not one to slice the semantical salami too thin, I'll admit that this feels like a pretty major shift to me, which is why I'll be starting small. I was pleased to see a recipe recently in the New York Times of all places for Squirrel Gumbo. Regular readers know that I'm a fan of Nawlins-style cookery, and though I haven't had the distinct pleasure of tasting our bushy-tailed tree rats yet, I'm pretty sure I can make one palatable in a spicy gumbo. But this is a ways off. My first shot at a squirrel will probably be in the spring when I visit relatives in Arkansas. My plan is to bone up on all the safety issues first and read some history and lore on the ancient bloodsport. Then, maybe, I'll do my Elmer Fudd routine. I'm both looking forward to and dreading this chapter. Somehow, though, it feels necessary. Gotta start somewhere, I suppose. Not sure I could stomach a squirrel. My mom just sent me a New York Times Natural Cookbook from the 70's. There's a recipe in their for Bat Stew if you need one. You never know. You have such a great perspective and approach to this. Pick up the LL Bean Game cookbook (title something like that, anyway) - it was published in the early 80s, Judith Jones is one of the editors, and it's been very helpful as I've tried to figure out what to do with the animals and birds my husband brings home. I've yet to actually take hunters' education (my excuse is usually that I'm pretty sure I'd be the only non-prepubescent boy in the room and that just doesn't sound like fun) so will be interesting to hear what your experience is like. When/where are you taking the course? One of the things that I love is the ethics and contemplation of wild game and hunting. It is both fascinating and eloquent, and I am excited about your writing that is to come. Almost done with the book. Wish we had more of what you have foraging wise in the south. Other than the greens and mushrooms, we only have whatever is in season to hunt. I'm looking forward to hearing about your conquests. any thought of trying trapping? Our Arkansas squirrels are indeed quite tasty. My personal favorite is squirrel and dumplings, or my grandfather's favorite, lightly breaded and pan-fried with biscuits and gravy. Makes the standard pairings pale in comparison. Check the seasons. Pretty sure you cannont hunt squirrel in spring. Pigs and turkeys in spring, pigeons anytime. Deer in August in California. Welcome to the journey! Foraging and fishing have already given you a big head start on hunting. You know how to check out habitat, move slow, and pay attention. Spotting tracks and other sign is easier than spotting many mushrooms, at least in the opinion of this lifelong hunter and recent mushroom seeker. As for the rest, apart from firearm safety and shooting skill, which is a whole category to itself, it's just a learning curve like trying new water for a new species of fish. You'll have a lot of fun and find yourself learning a lot of things. You probably already know of areas you've seen grouse a few times- head there this fall and try to collect on of the best wild meats available! 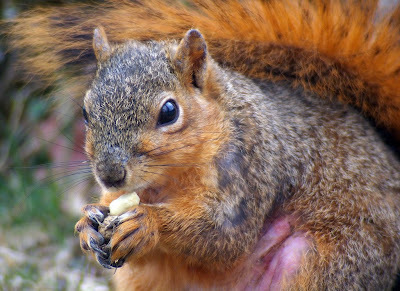 Many southern states have a spring and a fall squirrel season. Looks like we made similar resolutions this year! After years of target shooting with bow and shotgun I've decided to start hunting as well. I can recommend the Kenmore Gun Ranges http://www.wcwinc.org/ as I used to shoot target archery at their facility in the Summer and I'm planning on taking a Hunter Safety refresher and a Shotgun Basics there with my wife, who is totally new to guns. For me, the biggest challenge is not the equipment or safety, it's the where, when and how. I only know one other hunter in this area and this seems to be the sort of thing you need knowledgeable friends for when you're first starting out. Breaking into it seems strangely daunting. Hi Lang: I had never hunted before I got my first dog, ten years ago. Having more experienced friends to guide me was indispensible. I wonder if there are any hunting groups near you that could set you up with a mentor. Maybe check your state DNR site? For choice of weapon, a shotgun would probably be most versatile, since you'll begin with small game. mdmnm hunts grouse with a pistol (for cripes sake); most of us use a 12- or 20-gauge shotgun. A shotgun can also fire slugs if you do work up to big game. As your intitial quarry: what about rabbit? They're everywhere, they're plentiful (they breed like, uh, yeah...), there's a good deal of meat on them; and it's delicious, light years beyond farmed rabbit, in my opinion--and I like farmed rabbit a lot. Rabbit season tends to be pretty long, too. Have fun. I look forward to reports of your hunter's progress. If you're anything me, it'll take you a while just to stop being freaked out by carrying a gun around...! Oddly enough, I looked into 'bigger game' hunting about a month and a half ago. This was primarily because I love elk meat. I've hunted whitetail deer in Wisconsin, but I haven't hunted with a rifle for many years now. The elk hunt here seems complicated, however, and I agree with Russell that the most challenging aspect seems to be the when, where, and how. It would be nice to know some hunters in this area that wouldn't mind showing someone the ropes, but I have yet to find any. Elk tags appear hard to get as well, and the necessity of buying a license so that you can put in for the lottery (and not receive one, perhaps) seems silly (unless I got that bit wrong). But more importantly, how is a 5'4 girl like me going to get an elk out of the woods if I did manage to shoot one? It seems almost necessary for me to go with a group, but finding a group willing to include a random newcomer is most likely going to be difficult. For the squirrels, I had a really hard time finding any good information about shooting or not shooting them. All I found out was that the Eastern Gray Squirrel inhabits our city. It is not native here, and has pushed the Western Gray Squirrel out of its natural range, for which I think the latter is now considered endangered. In any case, you can't shoot the Western Gray Squirrel because it's protected, and you can't shoot the Eastern Gray Squirrel because they live primarily in the city. There seemed to be mention of another species that was good for shooting, but I don't think it was located quite a distance from the Seattle area. I don't attempt to hunt when I go back to Wisconsin because a) it would most likely only be small game open at the time and b) out of state hunting licenses are expensive. Even if deer were open, the cost of the license, tag, and flying the meat home would not be economical. I great up among game hunters, and so the idea of hunting doesn't throw me for a loop like some other things. Not so many squirrels passed through our kitchen -- but definitely deer, sometimes a rabbit, and quite a few grouse and pheasants. Enjoy hunter's safety. I took a course when I was 12, and it was quite the adventure for a young girl. Even one from Wisconsin! There's no need to get 'firepower' in order to bag game when you can use eco-friendly pressurised air instead! Specially since you're in the States and are not limited to silly power limits like us poor suffering Brits. Over here on the Rabbit Stew Blog we bag game with nowt but fresh air, lead and German Iron! I want to say "kudos" for the preperation you are going through before setting off into the woods with a firearm. As a persn who lives in a rural area and quite often goes walking the woods, I appreciate any hunter that takes the time to learn the fundamentals of walking around with a weapon. Good hunting. Thanks for the thoughtful comments everyone. Your support is a true shot in the arm. I want to respond to you each individually but will wait until I'm within reach of a laptop (rather than this iPhone) in a few days. Hope your New Year is off to a good start! The squirrels in my backyard are happy, fat damn campers. Come on over with your sling shot - we'll make gumbo. I grew up eating all kinds of game, from pheasant to moose thanks to grandparents and a father who hunted, but harvesting artichokes is about as brutal as I get with my bare hands and a knife. I look forward to being inspired by your next misadventure. Happy New Year. My squirrel skin stock is getting quite bare. which brings up another aspect of hunting you will have to incorporate. Can't wait to have you down to the Rogue or Nor Cal for some of that rootin', shootin' n cookin' this year, Lang! ..and the grays are always better option than the reds when it comes to squirrel taste and size! This is exciting! I would definitely eat a squirrel. Then again, I've also eaten from produce dumpsters behind safeway. On the UBC campus we have a squirrel pandemic. Once I saw a squirrel as big as a cat eating a bagel and cream cheese as though he were on his lunch break. Love the blog, and I heartily recommend squirrel. My wife and I took up hunting about 5 years ago, as a progression from our gardening/canning activities. I read up on field dressing/skinning/butchering deer, and found it daunting, so I decided to start on squirrel Greys are considered an invasive species in BC with no bag limits or closed season, so I was able to start in the summer, before my first deer season. I had been planning on using the meat as catfood, but when I got the skin off, the meat looked so rich (and there was much more meat than I expected), that the cat lost out. We use as a rabbit replacement and my wife says she prefers squirrel to venison. On getting started, may I suggest that you start with a .22 rimfire, as the ammunition is cheap, so you can put in lots of range time. They are very versatile, ie. we use them for squirrel, rabbit and grouse on the ground (no plucking out shot and feathers from the meat). I also recommend buying a used firearm as guns are like cars or jewelry, they drop in value by 30% as soon as they leave the store. It is definitely worth the effort. We get a great deal of pleasure eating meals where all the vegetables/herbs come from our garden, and the meat comes from our fall hunt. Good luck. Hunting definitely moves beyond gathering, but they've gone hand in hand for what, 40,000 years? Seems like a natural progression for you. It will definitely be a skill stretch, though, and I look forward to future posts about your first attempts. In addition to a successful shot, there's also a successful butchering between you and your gumbo. There might be some research and practice needed there, too. I recently reluctantly returned to hunting myself, after having not shot a hunting rifle since I was a child; hunting just wasn't cool enough for a teen or young adult in the 1980's. I recommend the Thompson Contender G2 rifle with the Winchester 30-30 barrel for deer. It is light 5.4 pounds according to the company (mine actually weighs a bit more)it is simple single shot break action weapon and you can buy and attach barrels for other calibers even, so I am told, a 410 shotgun barrel. For squirrels I think you might do better with a slingshot, the type we made as kids out of surgical tubing and pipes, I have also seen commercial versions of the same thing. As children in rural Louisiana we shot lots of small game with our slingshots, squirrels included, using rocks, bbs and our ammo of choice large ball barrings taken from appliances and also used in marbles games where they were called them "steelies." Much safer and more fun than a rifle but if you must use a rifle you can by a .17 hmr barrel for your Contender as well and it fires without kick just like it was a toy...but it's not be careful. I also used to be a regular firearm and bow hunter back in Michigan, as well as a fly fisherman. I've lost touch with all that and am interested in getting back into it out here in Oregon. As Hank said above, welcome to the hunting journey! I think it's different for those of us who come to it as adults. Everybody's right - squirrel is fine, and start with a .22LR (rimfire). The ammo is cheap and it's a great way to build confidence shooting and maintaining a firearm. Especially with all the outdoor blogs around, there's no shortage of information. Good luck! I see that today is squirrel appreciation day, so by all means a good day for squirrel gumbo, but make sure to appreciate it. Husband has been bow hunting for 35yrs here in Wa State. Just like mushroom hunters, no one wants to show you where, when and how to shoot in the area they hunt and hope to be lucky enough to bring home a deer or elk. As we've been learning to forage while he hunts I've had help and I have brought friends along and shared our knowledge. If you would like you could go out with us.